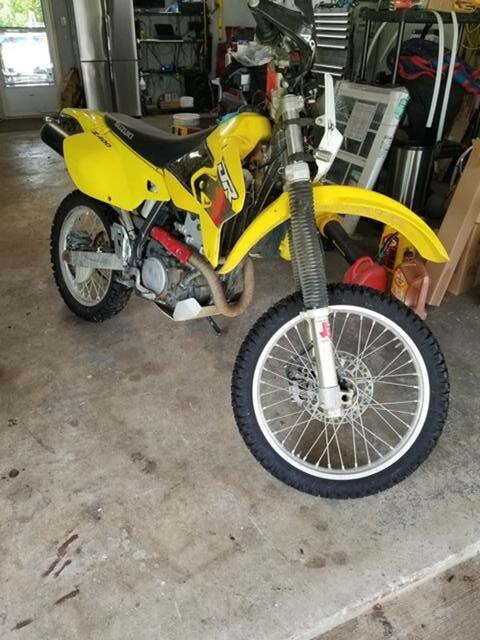 Previously I've owned two other Suzuki DRZ400's in the Supermoto form which is when you take a dirt bike and put smaller street oriented wheels on them with street tires. Suzuki sells the DRZ in SM form direct from the factory. They are formidable weapons on tracks and roads where the straights are short and the twisties are tight and plentiful because their low weight makes them handle very well and overcome their low power. Sadly, that does not describe the roads around here and as such the bike was't being ridden much. I'd been tempted by the ADV bug to get out and explore the places where pavement ends and a DRZ could do that. I figured I'd pick up some inexpensive dirt DRZ wheels and swap out the ones on the SM and be good. After all, those wheels should be plentiful thanks to the folks forking out for supermoto wheels, right? It was not to be the case. I was looking at $800 for some crappy wheels all the way up to $1500 for new wheels. No thanks. On top of that, the DRZSM I owned had a lot of suspension mods for the street that I'd have to swap out and it had a very expensive exhaust that I didn't really want to drop onto rocks somewhere out in the middle of nowhere. For the cost of the swap alone I could pick up an entire used dirt model DRZ. Thus, the Supermoto went away and I started the research. Decision made I started keeping an eye on the for sale ads. This little gem popped up on the Two Wheel Texans page down in Houston. This is an E model which means it comes with the carburetor that most folks swap onto their S or SM models as it is smoother and provides more power. 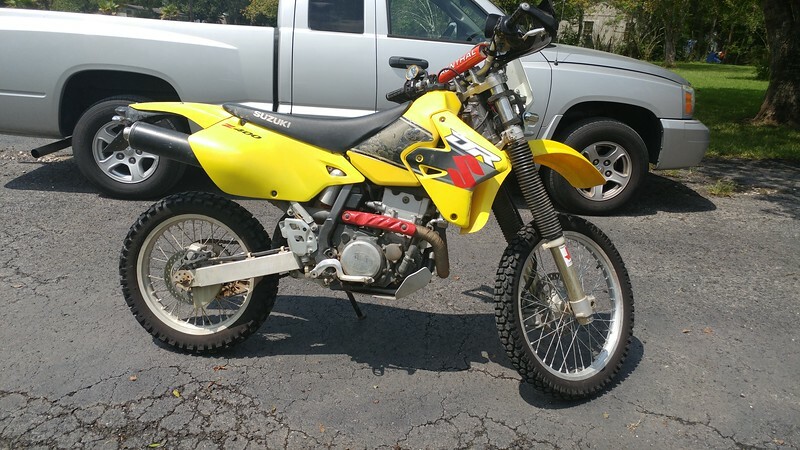 The carb will run you about $600 for the swap but this one already had it, and was priced right. It's 16 years old but Suzuki hasn't updated the tech or design in about 18 years so functionally it's the same as a brand new one. This one has seen limited use over the years thus was a good one to go and grab. We had a family event planned in Houston in a week and a half and the seller agreed to hold the bike for me till I could come down. Little did I know at that point that Mother Nature and Hurricane Harvey would have other plans for me. 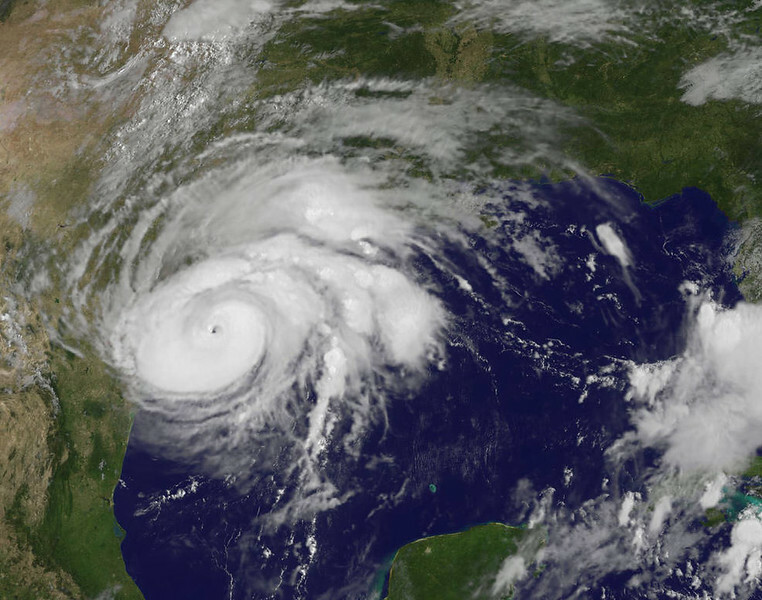 Hurricane Harvey came ashore near Corpus Christi and then moved up and parked over Houston dumping at times up to 6 inches of rain per hour and a total of 50 inches before it moved on after almost a week. Much of Houston was flooded in one of the worst flooding incidents in US history. Needless to say, our family plans were cancelled and picking up the bike was a no-go. I kept in touch with the seller who was hunkered down watching the water rise up to his house. Thankfully the water never came into his house and they were spared for the most part. I kept an eye on the maps and as roads started to open up gas began to become scarce. Panic set in for the public and made things worse. On top of that a chemical plant caught fire near the seller's house causing many roads to be shut down once again. Saturday of labor day weekend came and I had a window of opportunity so I jumped in my truck and headed south. 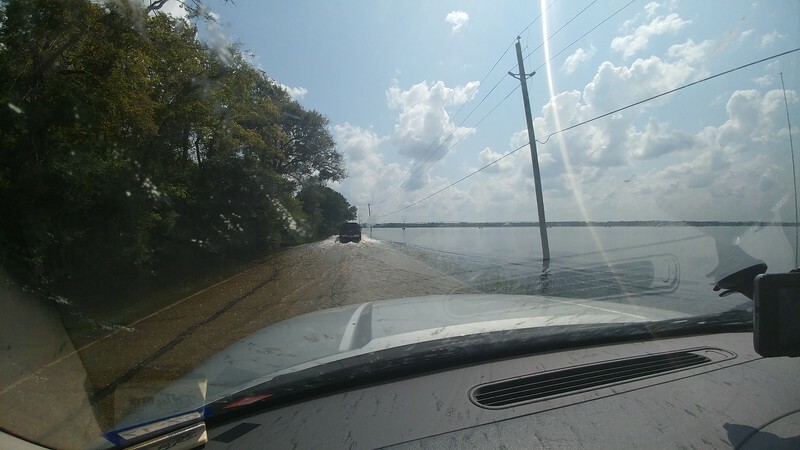 I took back roads away from the bigger towns and travel corridors and had no problems finding gas for the truck, which had been a worry for me as my truck won't hold enough gas to get to Houston and back. On the way I got a text from the seller saying he'd just been out and there's water on the roads but it's not deep and to just go slow. Thank goodness for his text and this truck in front of me or I'd have been tempted to turn around. As it happens, thanks to the fire at the chemical plant, this is the only way in or out of his neighborhood. On the right of that photo is a farm, not a lake. I had to travel several roads that looked like this but eventually made it to his house where the DRZ was waiting on me. I took it for a quick test ride and found that others in his neighborhood were not so lucky and many were busy gutting their houses because of the flood damage. Houston will have a tough recovery from this hurricane. 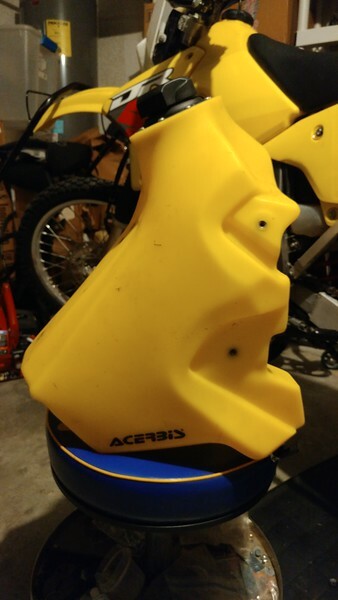 I mentioned to the seller that one of the first modifications the bike was going to get was an extended range fuel tank. I saw a light bulb pop on and he went and dug through his shed and came out with this tank and offered me a killer deal on it that I happily accepted. That tank will give a little over another gallon of gas extending the range of the bike to hopefully about 160-180 miles on a tank which is needed in some remote areas I'd like to ride this bike. We exchanged money and paperwork and I was soon on my way home via I-45 and made my way back to the DFW area with no issues.